The city of Lyon has a special energy for several reasons. Perhaps the most obvious is that it is the spot where two mighty rivers merge—la confluence—of the Saône and the Rhone. It is an exciting and powerful moment when that much water flows together. The article that accompanies this blog shows a picture of this spot as well as other parts of Lyon, but there are some aspects of this lovely city that I appreciate and that the article leaves out, so I want to add a few words of my own. Lyon has two captivating historical parts: its origins were on a hill overlooking the city when the Romans founded the city they called Lugdunum in 43 BCE. Here you can visit a large Roman theater with a capacity of 10,000 spectators! It's an inspiring site and close by is the basilica Notre Dame de Fourvière, with its décor that always reminds me of a wedding cake! Just below the hill is my favorite part of the city, le Vieux Lyon, a whole “quartier” from the 16th century. Adding to the charm of the narrow streets and ancient buildings is the presence of pathways through buildings that join two streets. In the 16th century Lyon was the capital of silk weaving in France and the merchants would carry their wares along inner passageways to protect them from the rain. These passages are called “traboules”. There are 230 traboules in Lyon, and although many are closed to the public, in Vieux Lyon you can walk through 33 of them. Often at the end of a corridor you will open into a delightful inner courtyard with an ancient well and dwellings above where people still live in the historic buildings with their lovely Renaissance arches. It is an experience not to be missed. The longest traboule is at number 54 Rue saint-Jean. It goes through five courtyards to reach Rue du Boeuf, at number 27. So if you get the chance, don't miss Lyon. With this lovely article on Christmas in France from France Today, I would like to share the love and warmth of this beautiful season with all of you. This time of year has so much significance to so many on so many levels. The Solstice which brings a promise of the light to come; the Christmas tree and the greens that we bring into the house to have the aliveness of the plants with us in the darkest time of the year; the lights, the gifts, the joy of children, the familiar music, all raise the vibration of mankind and remind us of a higher way of goodness and beauty. May that love be with us all and guide our thoughts and actions in the coming year and beyond. *Meilleurs voeux. If you are like me, you never tire of seeing beautiful photos of France and reading about French culture, charming villages to visit, cuisine, markets, and all the other delightful aspects of the country we love—and that is the most visited country in the world. For a feast of enticing images, articles and information on France, I want to highly recommend one of my favorite web addresses. The website is hosted by Janine Marsh, a lovely British woman who has settled in France. She also publishes a delightful online magazine and sends out a weekly newsletter—all absolutely FREE! Janine is a professional travel writer and has a heart full of love—not only for France but for her large collection of cats, dogs, chickens, ducks, geese and any critter who finds its way to her door. The link below will take you to the website where you will find a very nice article that she wrote about me and my work. The whole operation of The Good Life France has Janine's warm and friendly touch to it. I am really glad I found her, and you will be, too. My apologies to those readers who don't read French, but I think you can get the idea from most of these amusing takes on our cell phone use. I think the one about “how nice for the whole family to be together” while they are all consulting their devices is particularly sad. Don't forget to breathe the fresh air, listen to the birdsongs and connect with other people and animals. There's a Real world out there to enjoy and love. Quiz on French table etiquette. This is a fun little quiz to check ourselves on what we know—or don't know—about the French table. Even though I have spent a lot of time in France, I still missed some to my surprise! The art of eating is so important to the French who give a place of honor to meals. Having a meal with friends or the family is an important rite to the French. This little quiz will help us all fit in just a little better. Le Musée d'Orsay gets my vote as one of the most enjoyable places in Paris to spend a few hours. Although most people go to enjoy the beloved Impressionists, I want to take you on a visit to the building itself which has so many stunning points of beauty. I recommend you start your visit in the morning hours soon after opening. This building was once a railroad station from the 19th century, so as you walk down the center aisle after entering, look up and around at the iron work from the original station, and above all, turn around to admire the beautiful clock over the entrance. Since this article features the building, I will deliberately try to walk you along without mentioning the art works you will stop and see along the route. But as you go down the central hallway, the pre-Impressionists are in little rooms to your left, and dramatic sculptures line the pathway. At the end of the first floor you can walk on a glass floor to look down on a model of 19th century Paris featuring the Opéra and surrounding streets. To the left of this exhibit there is an escalator which takes you up to the Impressionist collection. Follow the signs “Suite de l'Impressionisme.” Once on the next level, across from the gift shop, don't miss the famous and massive clock on the outside of the building. This is a super photo spot: the shot through the hands of the clock reveals Sacré-Coeur high on the top of Montmartre. From here you will follow the galleries showing the art of the most famous 19th century Impressionist painters and at the end of the galleries there is a tea room. I recommend eating lunch later on in your visit at another spot in the museum, but you should enter the tearoom where there is an exit onto the roof with a fabulous view over Paris. Continue along past the works of Van Gogh, Gauguin and Seurat, and find the room with the pastels of Toulouse-Lautrec, in dim light to protect the colors. As you exit this room you will be in front of a stairway. Go down three flights of stairs, turn left and walk along the hallway to an elegant room on the right called “La Salle des Fêtes”. This was a room in the hotel which adjoined the Orsay railway station, and carries us back to another time of opulence with its crystal chandeliers and lovely statues. And finally, go back out of this room and retrace your steps, turning right and following signs to the restaurant where I recommend having your lunch. This is another beautiful room in the style of the period, and it is a real treat to dine in this elegant ambiance. As a P.S., it's good if you can plan it, to visit the Rodin Museum just after your Orsay visit, since both museums are open on Tuesday when all the other French museums are closed. Here you can find an outdoor café for lunch or refreshments. The Rodin is an easy walk from the Orsay. Hard Words #9 The capital city of the lovely province of Normandy has caused grief to many an English speaker! Rouen was named as one of the hardest words in French by expats in the online news magazine The Local.Fr. In this video I teach why it has only one syllable and how to put that troublesome French r on the front of it. For an opportunity to take your French to a whole new level, check my website under “Courses” for information on my excellent video program. Remember that the reason this part of Paris is called “The Latin Quarter” is because here are found France's oldest and most prestigious educational establishments. Since medieval times the major schools and universities have been located here, and in that time period, Latin was the language of scholarship. So I thought it would be appropriate to at least walk past and learn a bit about some of the great institutions of learning located in this part of the city. Walking south on the Boulevard St-Michel, you will pass on the left the chapel of La Sorbonne. The Sorbonne dates from the 1100's and is still the seat of learning particularly for the Humanities. There is a very attractive little plaza in front of it with some enticing cafés for having a little something before continuing the stroll. In just another block or two turn left onto la rue Soufflot and you will have in front of you one of the most dramatic sites in Paris, the Panthéon. This beautiful building was completed in 1791 but has an interesting history. Way back in 507 A.D. the king Clovis converted to Christianity and built a basilica on the spot where the Panthéon stands today. Sainte Geneviève, the patron saint of Paris, who protected the city from barbarians was buried in the basilica in 512. In 1744 King Louis 15 attributed his recovery from a serious illness to the prayers of Ste-Geneviève and decided to have built a prestigious church on the same spot, dedicated to this saint. His chief architect, Soufflot, made the plans—modeled after the Pantheon in Rome--but died before the project was finished. By the time it was completed around the time of the French revolution, it was decided to make of the building not a church, but a national pantheon, as a resting place fit for the great men of France. It is constructed in the neo classical style with grandiose Corinthian columns. So today it stands as a temple to those who have contributed to the glory of France, and across the top it says: Aux Grands Hommes La Patrie Reconnaissante (To the great men, a thankful country). Interred here are many of the most famous French such as Victor Hugo, Pierre and Marie Curie, Alexandre Dumas, Emile Zola, Jean-Jacques Rousseau and Louis Braille (inventer of the braille system for the blind). Just a bit to the left of the Panthéon is the lycée Louis Le Grand, one of the most famous lycées which offer preparatory classes for entrance to France's “Grandes Ecoles”, which we will touch on in a moment. And just at the back of the Panthéon is another of these lycées, Henri IV. For both of these high school age schools there are very difficult and competitive requirements for admission. Lycée Henri IV is known as one of the most demanding secondary level schools, and also offers preparatory classes for entrance into the Grandes Ecoles. One hundred percent of its students pass the rigorous baccalauréat exam, while the national average is around 80%. And a student here can brag that he or she attends the same school as some notable alumni such as Guy de Maupassant, de Musset, Jean-Paul Sartre and Simone Weil. The Grandes Ecoles are an elite higher education path outside the main framework of the French university system. Admission is by competitive written and oral exams that students usually spend 2 years preparing for, some of them at one of the two lycées mentioned above. Perhaps the most famous and prestigious of these special schools is the Ecole Normale Supérieur, located just a few blocks south of the Panthéon. This is the most selective and most challenging institution of higher learning in France, founded in 1794. It is a national legend and has trained the leading French intellectuals. Among its alumni are Henri Bergson, Jean-Paul Sartre, and Louis Pasteur. All of the French Nobel prize winners across all disciplines are alumni. You can almost feel the intellectual energy emanating from this part of the city. From the Place du Panthéon we will walk to the left of the building on rue Clovis and then turn right on rue Descartes. Following along on this street we arrive at Place de la Contrescarpe, a youthful gathering spot, in an old part of Paris at the top of what is called the Montagne Ste-Geneviève, one of the highest points in Paris. There is a fabulous restaurant just off the Place on rue Blainville called La Truffière where I always had the farewell dinner for my adult tour groups. It now has a Michelin star and is quite expensive, but will offer you an exceptional dining experience. For the less expensive fare that most of us look for, look no further: just keep walking on rue Descartes which changes name to la rue Mouffetard and you will find lots and lots of little eateries with outdoor dining, especially on a little side street called rue du Pot de Fer. This whole part of town is fun to tour at night, but if you are here during the day, just keep walking down the famous and narrow rue Mouffetard with all its shops and food and especially at the end of the street don't miss the well-loved produce market. The whole area described in this article is usually quite free of tourists, so just enjoy this special slice of the Left Bank. After leaving the magnificent Sainte Chapelle we re-enter the modern world and make a left on the Bd. Du Palais, turning left again on Quai de la Corse and noticing the two remaining towers of the medieval Concièrgerie. The Concièrgerie was a prison in the 18th century and it was here that Queen Marie-Antoinette was held prisoner during the Revolution, before her transfer to Place de la Concorde to be executed. We turn left again on rue de Harley, go up a few steps and enjoy the beauty of la Place Dauphine, a fairly undiscovered and quiet spot in Paris, and a good place to sit and rest for awhile. The lovely stone and red brick town houses that line the square were built in 1607 and one of them houses the restaurant Chez Paul, a Paris classic. At the end of the Place you will notice an impressive statue: the good King Henri II on horseback—and directly behind the statue, steps leading down to the Square du Vert Galant. This is our final destination of the day and where we finally get to eat the picnic delicacies we purchased a few hours ago at the Maubert-Mutualité outdoor market. As we enter the little park, we are under the famous bridge called Pont Neuf, which, despite its name, “New Bridge” is actually the oldest bridge in Paris, dating from 1607. It was built by King Henri II whose statue stands above it. The bridge crosses the Seine with 12 arches at the river's widest point. All along its length on both sides are a series of grotesque heads, each with a different expression. So we proceed to the very tip of the island and sit on the stones or benches to enjoy our group picnic. It is not against the law in France to consume alcoholic beverages in public, so go ahead and enjoy some wine as we share our various cheeses, pâtés and baguettes. But don't forget to look around you, for this is one of my favorite spots in Paris. First, you have a great seat to watch all the boats floating past, and speaking of boats, the Seine excursion boat company I recommend (because the boats are smaller and this location is easy to access) dock along this quai. In front of you is the lovely pedestrian bridge Le Pont des Arts, a destination not to be missed, especially at night when you get a view of Notre Dame on one side and the Eiffel Tower in the distance on the other. From our vantage point you also see one side of the Louvre across the river and almost directly across from where we are sitting, the former large department store La Samaritaine, a Paris icon. It was built in the 1920's in art deco style and was previously a very popular site with its roof garden offering one of the best views of Paris. It has been undergoing renovations for several years and when completed will house shopping, food stalls, a luxury hotel, office space etc. Most of the building, which spans two blocks, is a UNESCO World Heritage site. So we come to the end of my favorite day in Paris, our visit to Ile de la Cité. It is a tour lasting about three hours but it took five blogs to share with you all the details. And we did go literally “from one tip of the island to the other” all the way from the Memorial to the deported ones to the picnic spot. Linger and rest in this special place before your afternoon activities. Bonne continuation! From the moving Mémorial aux Martyrs de la Déportation which we visited in our last blog entry, we move across the street to the magnificent Notre Dame de Paris. I like to stop first at the rear of the church to appreciate the dramatic flying buttresses (les arcs boutants) and to give a little overview of Gothic churches. Many of the major Gothic cathedrals in France are built on ancient worship spots from before the Christian era. Early peoples recognized a special attraction or energy at those locations and designated them holy places. So these cathedrals have an element of sacredness not just because of their being a Christian place of worship, but from far back in human history. And over the years participants in my tours have reported feeling in fact something that moved them inside these churches. But let's get back to the view we have before us, the flying buttresses. Prior to the 12th century, church architecture was based on the Roman style, with its rounded arches which could only support a moderate height. But in the 12th century a breakthrough happened. Architects discovered the principle of the “buttress”, a support on the outside of the building which pushed in against the weight of the walls. This style allowed the walls to go much higher, and also incorporated the graceful pointed “gothic arch” associated with this time period. Another marvelous aspect of the buttresses was that the walls could be thinner, which allowed windows to be installed and this caused the flourishing of the art form we all love, stained glass windows. So as we stand here we admire the particular kind of buttress known as “flying buttress” which show us dramatically the thrust of these supports against the walls. It is interesting to note that the most authentic and beautiful Gothic churches were all built in the 1100's and early 1200's. At the front of the church, always flooded with tourists, move back away from the entrance to get a perspective on the façade. Over the west entrance is a row of 28 statues called the King's Gallery. They represent the Kings of Judea and Israel, mentioned in the Old Testament. But in 1793, the Revolutionaries thinking they represented the Kings of France pulled them down and cut their heads off! The heads can now be seen in the Cluny Museum. It was only in the 19th century when the famous architect Viollet le Duc did renovations on the church, that these statues were re-created and installed where we see them today. The rose window over the entrance is nearly 30 feet across and is so perfect that it has never shifted in over 700 years. It forms a halo to the statue of the Virgin and child supported by two angels. The twin towers are 226 feet high and in the right (south) tower is the great bell, tolled only on solemn occasions. Inside the church there are hundreds and hundreds of tourists which often make the experience feel less than sacred! Try to let that go and sink into the beauty of this exquisite monument over 850 years old. Usually you must follow a path to the right. Be sure to stop at the transept, or the cross section that goes across the altar in the center. Here there are several things to notice. First, to the left and above you are the breathtaking north and south rose windows. Be sure to take your time here to enjoy the vibrant colors and the stories they tell. And just in front of you, to the side of the altar is the delicate and lovely 14th century statue of Mary with the Child—Our Lady of Paris. The next visit of our day on Ile de la Cité takes us to the beautiful Sainte Chapelle and ends with our picnic at the other tip of the island. Don't miss it! We left you last on the bridge taking great photos of the back of the Cathedral, Notre Dame de Paris. Now, as I mentioned in the last blog, we are going to visit a very special spot just at the tip of the island. As you leave the bridge and step onto the island, turn to the right and go into the little park called Square de l'Ile de France. You may notice a short wall ahead of you with writing on it. This is the Mémorial des Martyrs de la Déportation, a memorial to the 200,000 people deported from France during the 2nd World War, who went to their deaths in the extermination camps. This memorial was inaugurated in 1962 by General de Gaulle, then President of France. But most people don't ever find the memorial since there is no obvious indication. Even many Parisians have never been here. Notice a flight of stairs leading down. There may be an official at the stairs to inspect bags. Go down and you will find yourself in a stone enclosure suggesting a prison. Be aware that you are in a very solemn place and respect the silence and the feelings that arise in you and others around you. At the very tip of the island where you can see the river below, a metal sculpture gives the feeling of impossible escape. 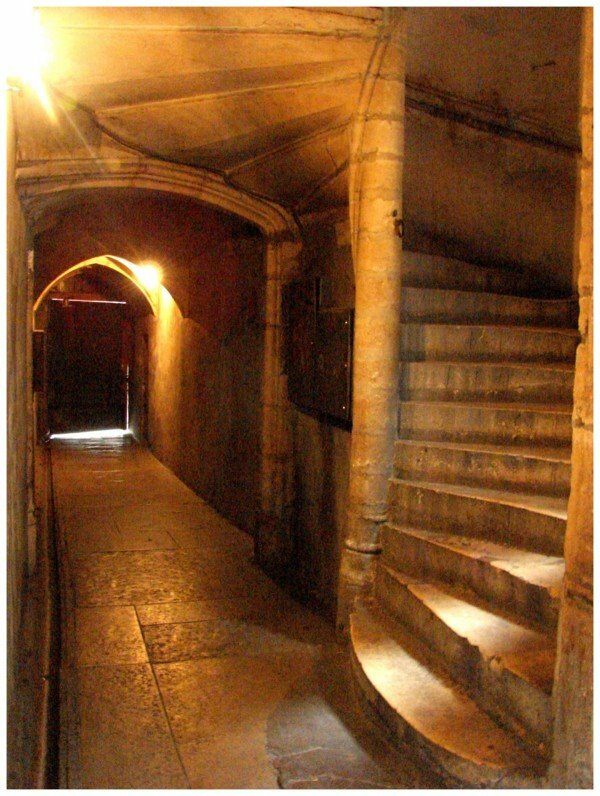 Look back toward the stairway and you will notice a very narrow entrance to the crypt. Designed by the architect Georges-Henri Pingusson, the hexagonal, dimly-lit crypt opens onto a long gallery covered by lights, representing each of the 200,000 deported people killed, and the ashes of an unknown deportee from one of the camps. Whenever I visit this memorial I feel deeply moved and I am not the only one shedding a tear. You feel engulfed by the silence and the memories. The writings on the walls look like they have been scratched from the stone and are red to suggest the suffering. The two small galleries contain earth from the different camps and ashes brought back from the cremation ovens. All around, are the names of the camps and excerpts from poems by famous French writers like Robert Desnos, Jean-Paul Sartre and Antoine de Saint-Exupéry. And in leaving the crypt, over the door it is written: Pardonne, n'oublie pas. Forgive, don't forget. May you hold in your heart the message of this visit, long after you leave the spot. In the next blog we will move across the street to visit the mighty cathedral of Notre Dame de Paris. Please join me there.